As we gear up for the 13th annual Chateau Sonoma French Flea Market on May 27th & 28th, I thought I would share with you how it came to be. It was during one of my first buying trips to France that I discovered the magic of French flea markets. Terry and I stood pressed against the outside of the gates of Montpellier excited and nervous all at the same time. We were quite intimidated, and at one point, thought we may have been in the wrong place as we were surrounded by hundreds of people, mainly men, almost all of whom were chain smoking. Our first instinct was to run for the hills, but the gates finally opened, and we were shoved to the other side and watched in awe as everyone ran in a different direction. They all seemed as if they knew exactly where to go, and would do anything to be the first to grab that one-of-a-kind item as it came off of the dealer's truck. Each time we visit the markets of Montpellier or Avignon I am overcome with adrenaline before the show. I am sure it is similar to the feeling of a race horse approaching the gate. Once inside, the fun begins! We walk briskly up and down the isles in hopes of discovering and purchasing as many treasures as possible in the shortest amount of time. These markets, that only occur four times a year in France, are filled with the most extraordinary items I have ever seen. We have found oversized clocks straight out of a train station, spiral staircases from a chateau, picture frames from the time of Napoleon III, rare butterfly collections, and so much more. After the buying frenzy is over, folks head to the the outdoor bar in the middle of the market for a more relaxed and civilized "Joie de Vivre" experience that the french are know for. The smell of sausages and frites wafting in the air and glasses filled with rose clanking as buyers exchange stories of the deals they made and treasures they discovered. 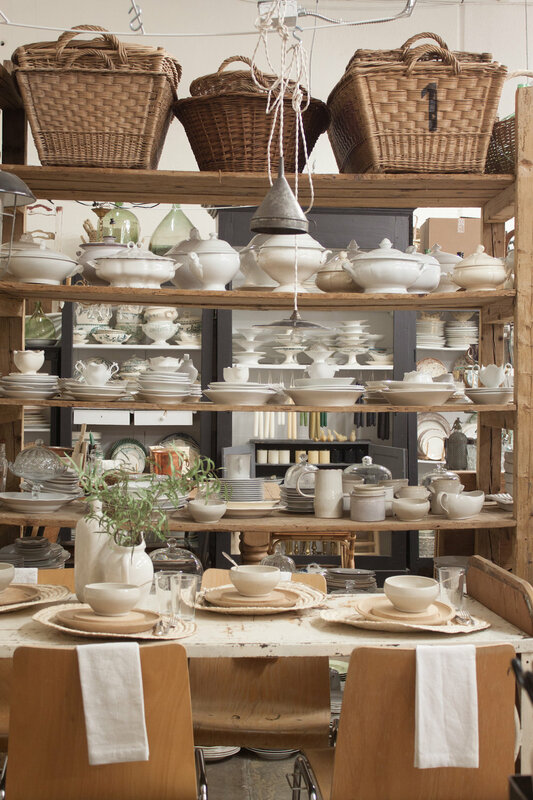 The experience I had at my first French flea market inspired me to recreate it here in Sonoma. For the past 13 years, we have worked very hard in finding the BEST dealers who import directly from France and bring it home for you. In addition, we have recreated the overall ambience of an authentic French flea market that will export you to this other world without the jet lag! Michel – our favorite French gypsy – will also be there with his barrel organ. Since its inception, The Chateau Sonoma French Flea Market has been a place to celebrate our love of the French way of life! We are very excited to welcome over 20 vendors including Elsie Green, Uber Chic, Atelier de Campagne, and many more! 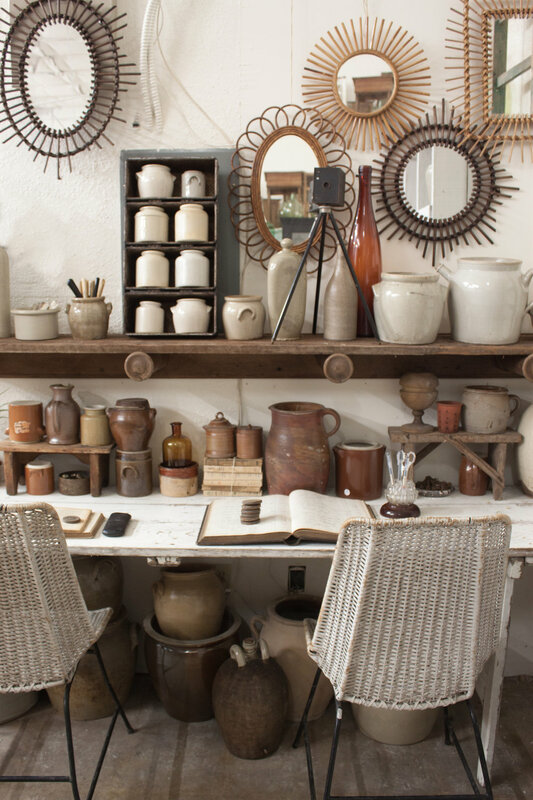 We cannot wait to see all of their beautiful antiques and objet d'art. We hope you will be able to spend Memorial Day weekend with us at our new location at Cornerstone Sonoma! Many thanks to Maria from Dreamy Whites for these beautiful photos from our 2014 flea! "Chateau Sonoma is such a great host for the French Flea, and the crowd is so wonderful; we always love getting to mix and mingle with such a fun crowd! We look forward to this weekend every year!" The annual French Flea at Chateau Sonoma is absolutely one of our favorites. The ambience in the area, the ambience that is created by Sarah, and of course what each of the unique vendors brings to this gathering makes it magical. I like that it is not a huge market; the focus in on quality and not quantity. Johan and I actually select some of the items as we find them in France, "This one, we will take to Chateau Sonoma." This year, we are excited that we will just have received our new container so we will have lots of fresh treasures to bring. STAY UPDATED BY FOLLOWING OUR FACEBOOK EVENTS PAGE!